I have been waiting for this day ever since I heard Nomar Garciaparra, who was then the beloved shortstop of the Boston Red Sox, and Mia Hamm, who was then the idol of every soccer-playing girl in the Western Hemisphere (including this one), were an item. Like two champion racehorses carefully selected for speed, agility, and bone strength, Nomar and Mia have produced two infants of prodigious athletic ability. The twins, whose dam surely spent the gestation carefully monitoring her intake of folic acid, calcium, and whey protein, are expected to hit .400, leap tall buildings in a single bound, and start speaking in about two years. With Garciaparra as their sire, however, doctors should carefully monitor their tendons. LOS ANGELES —Former soccer star Mia Hamm, wife of Dodgers first baseman Nomar Garciaparra, delivered twin girls late Tuesday. “Both are healthy and over five pounds,” Dodgers spokesman Josh Rawitch said, adding the births took place in the Los Angeles area. While 5 lbs may not seem like much, we must take into account that at 3% bodyfat, the tykes are still in the 99th percentile for their age (1 day). Moreover, there’s nothing wrong with them that a little time and HGH won’t cure. 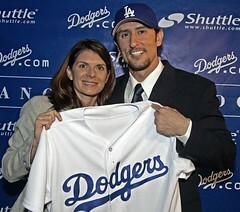 That Nomar sure is one lucky guy!